Homes4NC was founded in 2004 on the principle that every North Carolinian is deserving of affordable housing and strong communities. With a foundation driven by consumer necessity fourteen years ago, the demand for Homes4NC’s core services are needed more today than ever before. Rising housing prices and inventory shortages are pricing some deserving homeowners out of their local market, and some communities are facing hardships due to these and other factors. Perhaps never has the need for Homes4NC to break through the white noise of other organizations serving in a similar capacity been so great. With a total community investment across North Carolina in the amount of $1.1 million, Homes4NC is just getting started. But, Homes4NC aspires to have instant recall and name recognition with an awareness of its purpose. Homes4NC’s mission needs to be clear to consumers and other stakeholders. However, Homes4NC’s name isn’t synonymous with its mission. Furthermore, Homes4NC’s bylaws were changed in 2016 to reflect inclusion of emergency disaster relief in the form of housing assistance. Therefore, a new name with a contemporary brand were sought. 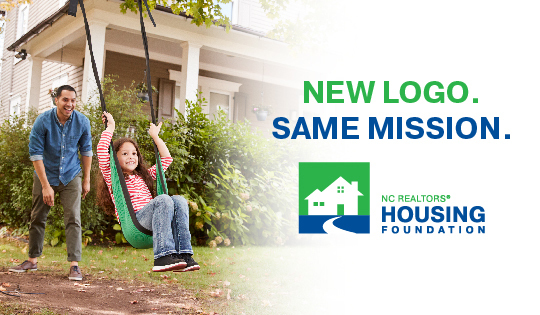 In 2018, Homes4NC became the NC REALTORS® Housing Foundation, and a new brand identity was born. Both more clearly reinforce the organization’s mission and core values, while adopting a more modern and appealing aesthetic with drastically improved utility applications.